As Ukraine is caught in a socio-political whirlwind, Russia is locked in a standoff with the US, and Europe is counting losses from the transcontinental crisis, we talk to a very special guest on SophieCo. A former US Congressman, presidential candidate, and a man with nationwide support for his views on what government should be. A legend of American politics, Ron Paul is on our show today. Sophie Shevardnadze: Veteran US congressman Mr. Ron Paul is with us today. Mr. Paul, it’s great to have you on our show. I’m going to start with the latest news: NATO suspended all practical cooperation with Russia, military and civilian activities. Now, how’s that going to help resolve the crisis? 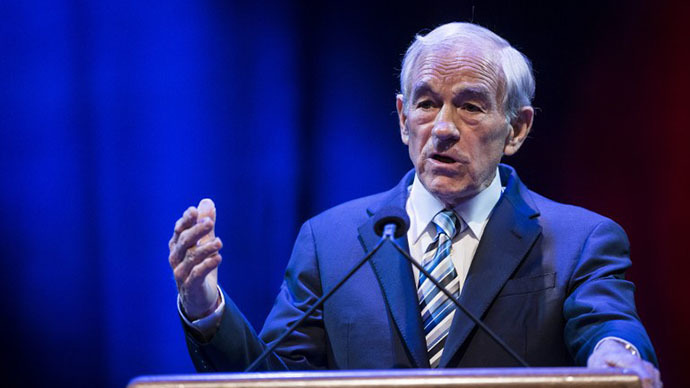 Ron Paul: Well, it won’t. It’s going to make it worse, it’s just pestering and interfering…one thing is that my goal has always been to have cooperation and diplomacy rather than antagonism and talking back at each other, and sanctions; they don’t do any good at all! So, I’ve always been more on the optimistic side since the Cold War ended, because we were trading more, and talking more, and traveling more with Russia and China and different places in the world. So, to me, if you trade with people, you do better. So any time you suspend anything like that, it’s negative. So I’m sorry to hear that and certainly I don’t think it’s going to do any good to improve the relationship; it will just encourage both sides to keep going at each other. SS:And then, there are also the ones who are caught right in the middle; for example, Afghanistan is really worried about NATO stopping cooperation with Russia over a number of Afghan-related projects, for example: training counter-narcotics personnel, maintenance of Afghan helicopters, et cetera. So what happens to those who are in the middle? RP: Well, that’s always a problem; it’s the people that are generally in the middle. Governments get involved and then do dumb things, and people in the middle are always suffering. So if they suspend anything, it’s the little guy that usually gets punished, and people who run governments and people who run big businesses and have the money – they seem to do OK on this. So, those ones in the middle, they probably would lose jobs. It’s hard to say what’s going to happen, but any type of sanctions or retaliation is detrimental to both sides, and I often thought that if people understood what was going on, they would express objections to this kind of bickering back and forth…so I think, the people in the middle, if we’re talking about the average person, people who have jobs, they suffer the consequences – I think that’s very bad. SS: Now, US Secretary of State John Kerry says “NATO is actually seeking to de-escalate and help things through diplomacy.” Does it look like that to you? RP: Well, you know, de-escalation is in the eyes of beholder. Sure, I’m sure he’s anxious to de-escalate on his terms; everybody wants to do it on their particular terms, and as long as people capitulate, and...You know, I advocate not picking sides, so I see two sides going back and forth. My political position as an American is for our American government to not be in the middle, picking sides, and picking governments, and interfering with elections. If there are problems in the rest of the world, the people closest to it should deal with it. I’m not even a fan of NATO – if you look at, you know, what NATO is intending to do, they want prices to go up on energy, they want taxes to go up, they want to freeze wages – actually, these policies are exactly opposite of what I believe in. So, I think that when we talk about NATO de-escalating, the odds of that happening are slim to none. De-escalation in my view would be for us to mind our own business, and let somebody who is really involved - in particular, the Ukrainian people are the ones who should be deciding all this, which way they want to go, rather than the governments of Europe or even the Russian government for that matter. It should be the people of Ukraine to decide this, so I don’t like either side building up this animosity, and I certainly don’t like our taxpayers and our government participating in something so far from our home. I’d rather mind my own business and take care of our own affairs. SS: Sure, and it’s the American taxpayers who ultimately are paying for NATO expansion. You don’t think it’s worth their money - or is it? RP: No, it’s wasted money, and it’s not the rich in this country that pay these bills. I mean, Congress just voted a billion dollars, which is just the beginning of their line of credit and their guaranteed loans going to Ukraine. NATO’s promising 18 billion dollars. We’re the biggest donors to the IMF. But the rich don’t pay for that, and actually, we can’t raise taxes right now because our economy is in bad shape. But we still pay for, because people still love our dollar and it’s a reserve currency, and we get to print it, but who suffers from that? The bankers are going to benefit, because if we send money to Ukraine, the bankers are going to be bailed out. As a matter of fact, even Russia may get some benefit from this too, ironically. As we send more money to bail out Ukraine, money is owned to Russia as well; they have to pay for the gas, so it may be an irony that Russia may benefit. But ultimately, the people of Ukraine are not going to benefit; they are going to suffer from austerity programs. And the people of America won’t benefit; even if it’s not direct taxation, the average person is going to suffer from the inflation, and in this country we have seen that the rich are getting richer and the poor are getting poorer, and it's because of a failed economic policy, and this is the reason I advocate sound money and free markets rather than government planning. SS: We’re going to get to Ukraine just a bit later. I want to talk about sanctions a little bit, because you’ve said a little earlier that sanctions are detrimental to everyone. American trader Jim Sinclair says the US is shooting itself in the foot with sanctions, because Russia could accept payment for gas and oil in other currencies, undermining the dollar. Do you think that’s possible? Is Washington prepared for that? RP: Well, they could…I think they should be free to do that, and I think that they should try to take care of their own business. I saw one place where Russia was going to have an exchange of services, just sort of an old-fashioned bartering - oil products for food products or whatever products they are looking for. So I would think in this age of modern technology they will be able to avoid, but also it’s detrimental when this international payment system is interrupted. There should be alternatives and there may well be alternatives; who knows, somebody might come up with the gold standard or something more honest than the type of system that we have today. SS:Now, you yourself have called sanctions an “act of war,” and unilateral sanctions are a common tool for the West to pressure other nations, so…The US is at war with many countries, like Iran, Cuba – isn’t it? RP: Well, if two countries get in war, one of the most important things that they do is that they put down blockade – they prevent trade so the various countries can’t get their raw products. So, in that sense, the economic sanctions is doing something that happens in wartime, and that is preventing a government from getting certain things that are needed for the war. So, this is the reason of course I’m opposed to this, because I think it’s wrong, and I keep thinking what's talked about here, in this country, when I was in office, is why don't we try to see it from the other perspective – how would we react if we couldn’t import something? What if China or Russia, or somebody came in and said: “You cannot import certain things, we’re going to prohibit you from trading?” The American people wouldn’t like that very much, and yet we too causally do that with others. But, in principle, it’s not quite like a shooting war, but it is a war. I mean it is something that’s used in an active war, in the ultimate for blockade – but sanctions is the form of blockade. Sanctions, “you can’t do this, you can’t do that,” and I think it only leads to escalation, and the countries that had sanctions…The sanctions against Iran have been on air for a long time, and on Cuba – but the leaders never suffer. The people suffer, in both countries, so this is the reason I think that sanctions in principle are wrong. SS:Why don’t the US lawmakers see it the way you do? RP: I don’t know, I guess we have to ask them. I’ve studied economic policies differently, and I have a determination to believe in personal liberty. I don’t like “planned economics.” I don’t like socialism, I emphasize the importance of the individual. But you might come back and say, “Well, isn’t that what Americans believe in, this is what they say, and that’s what your Constitution says.” That generally is true, but then when they go out and say, “Well, we have this problem, we have to take care of it, so we have to compromise our principles,” and the one I reason I have voted differently and have a different opinion is that I think compromising is bad. I think working with people is one thing, but working with another country, working with Russia and talking to Russia and trading with Russia, and working together – neither country has to give up anything or sacrifice; I work with coalitions and I don’t agree with other people on everything, but if I can work with people in this country, that happen to agree with me…you wonder why there aren’t more people that agree with me – there are few and I work with them all the time. So, I think you should work with people and have diplomatic relations with them the best you can, but not to sacrifice principle. You got to let people know what you believe in, and I happen to have a very strong belief in personal liberty, markets, and a system of government that does not, you know, provide great wealth for the few, and the world is engulfed with that kind of system, whether its in America or Russia or China, name the place yourselves. There’s always the wealthy, and my goal would be to emphasize liberty. We should have liberty for everybody, and have an incentive system, but that’s quite a bit different from what the world is engulfed with today. SS:Let’s talk about Ukraine a little bit. You have called Ukraine’s unrest “US instigated.” What makes you say that, and what role did it play? RP: I’m aware, it’s been in the media, and it’s no secret because the people who’ve actually done it, actually said it - and that is our ambassadors in the State Department - who have said that we have spent in the last 10 years or so over five million dollars trying to bring the democratic process to Ukraine, and yet after the revolution and our influence there, we ended up with the government, and in so many places around the world, the government was the one we didn’t like. And so Yanukovich is somebody the Europeans didn’t like and the Americans didn’t like, and yet we have already been involved too much, and we were on the course to doing this in Syria, and all of a sudden we find that the bad guys were getting the money. Al-Qaeda is actually getting the benefits and look at all the mess…So, they’ve admitted that they have done that and of course it was in an interview between our ambassador and State Department saying that who should we have as a leader of Ukraine – I mean, this is nothing but trouble. I might be able to give you an opinion of what I think should happen in Ukraine; I have a personal opinion of what I think they ought to do, but I’m giving the political opinion of what I think our government should do, and that is to stay out of it, because we’ve been way too much involved, and I think the evidence is very clear that the Europeans and the Americans were very much involved in the overthrow of the elected government of Ukraine. SS:Now, you said in the beginning of the program that you actually denounce the Congress approval of a $1 billion aid package to Ukraine. But the country is in shambles, I mean, really, its economy is on the verge of default. Someone has to give it money. If not America and the IMF, then who else? RP: The Ukrainian people, they need a new system. If you just bail them out, like we just bailed out all our rich people during 2008-09, the system continues, but the poor get poorer and the middle class keeps shrinking. So if you bail them out and say, “Well, we’re going to do this and send money over there,” I don’t think a penny is going to go to the people; they’re going to get a freeze in their wages, and they are going to have higher prices for their fuel and their taxes are going to go up. So there is no benefit. What they need is freedom, and the concept of property rights, and they need to work hard and they need to have an incentive system and they need to get rid of the central economic planning, and they would recover. But to have this so-called sympathy or empathy for the people who are suffering…There are people suffering in every place in the world. But on the principles of liberty…nobody has the right to use the gun, whether it’s a political force or through government and go and take from one and give to another – because you just make one person poorer and everybody poor. I see no justification, because there are needs in Ukraine, that all of a sudden an international government, whether it is the UN, or IMF, or NATO, or whomever, to go and take more money from innocent people and make somebody else poorer. I’ve argued that any time our country gives foreign aid to another country, you take money from poor people, in the rich country like ours, and give it to the rich people in the poor country. It never goes to the people. It’s taken from the poor and it’s given to the rich in another country, because there is always the rich in the different countries and that of course is what we have to change. SS: But this whole Ukrainian issue, the crisis around Ukraine – do you feel like it’s enjoying wide domestic support in America? Do people know, when they talk about Ukraine, what it means? What’s going on in Ukraine? RP: Well they know mostly what’s going on, from our news services and our government, and generally, the consensus of all the news media is that it's all one side; they are told that Russia caused all these problems, invaded a country and stole Crimea, and this sort of thing. That is basically the general thing, but now we’re starting to see a shift in attitude with the American people, which is very healthy, because there are others like myself, who have access to the internet and different ways of spreading information. We have people like Edward Snowden, who comes out and tells us what really is going on. And right now we are getting some polls that show us that, the polls in the US show that our president shouldn’t bomb Syria, and that we should talk to Iran, and right now the majority of people are saying…nobody in the US is calling for troops in Ukraine, so there is a shift. But right now, most of them sort of have bought into the idea that…it’s natural, nobody wants to blame their own government, people tend to be patriotic, they don’t want to blame themselves, and they don’t look at the details. But it’s not quite as bad as it seems beyond the surface, mainly because we have our internet to get some information out, and we are seeing some shifting of attitudes, which I think is very healthy in the direction of us minding our own business. SS:Now, you’ve also said that it's shocking that the US government and NGOs were on the side of the protesters in Ukraine. What’s so shocking about that? RP: Well, the NGOs, they get government money, and they are always in the business of influencing governments and different things around the world, radio broadcasting and different things…I don’t believe in any of that stuff. I believe that we should influence other people, though, by setting good examples. I have an ideal for a society which is free markets and personal liberty and limited government, and I think we should do it and set an example, and then others might want to say, “Hey, why is America doing so well,” so I want to influence them, but not with force, not by invasions and guns and propaganda..
SS: Alright, so in comparison to Crimean secession to Russia, President Obama justified NATO’s bombing of Kosovo and the US invasion in Iraq, of which he was a vocal opponent back in the day. Is there any room for comparison here? RP: I guess, a little bit, but we’re inconsistent about it because in Kosovo, there was just a declaration and we supported it; there was no election. So I think the president misspoke on that. So this referendum was much more open than what happened in Kosovo, and yet on numerous occasions we have supported certain events, whether there were elections or whatever. So I don’t think it's exactly the same and I think that we should not be so critical of what happened and just automatically say that this was illegal. The referendum was a lot more democratic than the overthrow of the Yanukovich government in the way I see it. SS: But also precisely because of issues like Kosovo and the war in Iraq, we can also think about Libya a little bit, America’s support for the Syrian opposition. Do you feel like Washington has lost its legitimacy to lecture other countries on international law and democracy? RP: For me they have, but the people still listen, power speaks, and economic power a bit, but it’s sort of the nature of government. I don’t find any of the governments as being sacred and always being upfront with the people, so I see it as the problem, with too much government everywhere. So I deal with too much government here, and yes, I think there was a lot of deception going on with Iraq – I strongly opposed that - Afghanistan, Syria. I want our government to have better trade relations with Cuba and Iran and all these things. But to lecture other people – I would think that there is going to be one day some built-up hostility redirected at US, because right now there is not much people can do, because we still are very powerful, but people do resent these things and they harbor them – look how long the Iranians resented the fact that we installed this Shah there back in 1953. So memories last a long time and that’s why I think that interventionist foreign policy on our part is not good for us, no matter what the argument is, and there is always the justification for why we need to do it, for national security, and for the various reasons. But everybody, whether in the US or any place in the world, they should be very cautious when their government tries to tell them that they are the absolute arbiter of the truth. For the most part, governments protect themselves and this is why we need more whistleblowers, and more information circulating around the world, so the people can make much better choices on who to believe and what to do with their own government. SS:Talking about whistleblowers – you’ve written that while all eyes are on Ukraine, in the USA Congress is ready to pass a bill that would widen the scope of NSA spying. Is Ukraine used to shift attention from matters for Americans? RP: Well, I guess there’s going to be some of that; they are already shifting attention from one to another, and I believe that we should reward our whistleblowers, that we should punish them. And yet we’re resorting to some authoritarian laws written back in 1917, to not only punish our whistleblowers, but also to punish our journalists. That’s what was commonplace in totalitarian society; we had way too many of those in the 20thcentury. So...it’s always down to National Security, and for safety and for patriotism, and therefore people have to go along with it. The only answer to that is getting the truth out and that’s what I see my responsibility is - to do my best job in getting the truth out and to defend these positions on a principle. For me, it’s a principle of non-intervention and protection of liberty for every individual. SS: Thank you so much for this great interview, we were talking to a veteran congressman and influential US politician, Ron Paul. We were talking about the crisis in Ukraine, the consequences that sanctions could have on both countries, and also America’s interventionist policy. It’s great to have you with us today. That’s it for this edition of SophieCo, we’ll see you next time.